Phyto-Touche Sun Glow Powder is a creamy powder that provides a unique sensory experience to create a customizable sun-kissed look. Its "wave" design comprises two golden beige shades for customizing the sun-effect and a blush shade to add freshness and brightness. Its imperceptible texture melts onto the skin like a cream for a smoothing, perfectly even result, with no powdery effect. The skin is instantly more beautiful. Phyto-Touche blends perfectly with the skin and stays in place for flawless, natural and long-lasting make-up. Its indulgent, non-comedogenic formula, enriched with Camellia oil and Shea oil, protects the skin over time and with repeated usage. 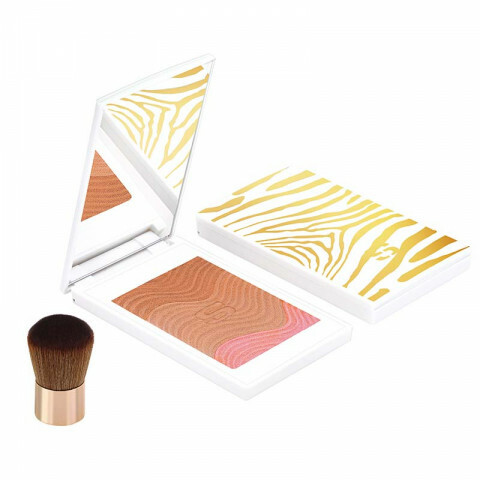 The golden zebra-print compact comes with a mini kabuki brush: an elegant make-up accessory-perfect for on-the-go application.Suitable for all skin types and complexions. I have Trio Peche Doree and love it! It gives a nice glow to the skin, perfect for fair or light skin. If you have medium skin or darker, I would go for the Trio Miel Cannelle. The mirror is big enough for you to see your whole face. It has great pigmentation!! Its really beautiful color.